Defend your network with secure printing from HP, orchestrated by CDW. Whether you own a small business, manage a busy branch location or run a large department, HP has the printer to meet your needs. From next-generation technology to one of the world's most secure printers, you can count on the legendary quality of HP. Get instant rebates on HP printers, MFPs and scanners. Act now — these discounts won't be around for long. Is your network at risk? Every printer decision is a security decision. Defend your network from evolving threats with one of the world’s most secure printers. Keep business running smoothly and productively without sacrificing security needs, thanks to HP's print devices and solutions. Whether single function or all-in-one, impress your customers with professional-quality color documents for up to 50 percent lower cost per page. Now available for 11"x17", HP PageWide technology prints across the page at up to 70 ppm for up to 40 percent4 lower color cost per page. Make your devices easier to use and even more productive. HP printers offer built-in security features that are always on guard. Architects, designers and print service providers turn to HP to meet their large-format printing needs with HP DesignJet and HP PageWide XL. Whether you're looking for discounts, trying to find the right solution or find a more business-friendly and cost-effective means of printing, HP has you covered. Original HP cartridges are designed to deliver results that are better for your printer — and for the environment. Find compatible HP ink and toner for your HP inkjet and laser printers. Qualify for free ground shipping, discounts on HP consumables and services like automatic toner ordering and budgeting assistance. For a predictable, low monthly fee, receive a new printer, up to 50 percent savings on original supplies and more. 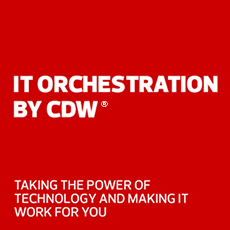 CDW has partnered with HP to offer award-winning security and Managed Print Services, simplifying IT ownership, support and management. HP helps you fix your problems quickly, whether it's increasing your printer security, improving uptime or avoiding unbudgeted repair costs. HP Care Pack Services provide highly trained support specialists for everything from custom installation to repairs. Do you have the resources to secure each device? As THE FIXER would say, "Trust your printer security to the pros, or you're gonna get eaten alive." 1. 'Most secure printers claim' applies to HP Enterprise-class devices introduced beginning in 2015 and is based on HP review of 2016 published embedded security features of competitive in-class printers. Only HP offers a combination of security features for integrity checking down to the BIOS with self-healing capabilities. A FutureSmart service pack update may be required to activate security features. For a list of compatible products, visit: https://www8.hp.com/h20195/V2/GetDocument.aspx?docname=4AA6-1178ENW. For more information, visit: www.hp.com/go/printersecurityclaims. 2. Lowest cost per color page claim applies to devices that are not sold under contract: Comparison of HP PageWide A3 devices with the majority of in-class color ink/laser MFPs ($3,000-$7,499), and color ink/laser single function printers ($1,500-$2,999) as of January/February 2017; market share as reported by IDC as of Q4 2016. Cost per page (CPP) reported by gap intelligence Pricing & Promotions Report January/February 2017, comparisons for devices/supplies not sold under contract are based on published specifications of the manufacturers' highest-capacity cartridges, inclusive of long life consumables and page yield. Average yield based on ISO/IEC 24711 and continuous printing in default mode. Actual yield varies based on content of printed pages and other factors. For more information, see hp.com/go/learnaboutsupplies and www.hp.com/go/pagewideclaims. 3. Comparison of HP PageWide A3 devices with the majority of in-class color ink/laser MFPs ($3,000-$7,499 and €2,820-€7,049), and color ink/laser single function printers ($1,500-$2,999 and €1,410-€2,819) as of April 2017; market share as reported by IDC as of Q4 2016, excluding other HP PageWide products. HP PageWide speeds based on General Office mode and exclude first page. Learn more at www.hp.com/go/printerspeeds. 4. Comparison of HP PageWide Pro and Enterprise class devices with the majority of in-class color laser MFPs <$3,000 USD, and color laser printers < $1,249 USD as of November 2016; market share as reported by IDC as of Q2 2016. Cost-per-page (CPP) reported by gap intelligence Pricing & Promotions report Oct. 2016, comparisons for all supplies are based on published specifications of the manufacturers’ highest-capacity cartridges and page yield. Average yield based on ISO/IEC 24711 and continuous printing. Actual yield varies based on content of printed pages and other factors. For details, see www.hp.com/go/learnaboutsupplies.